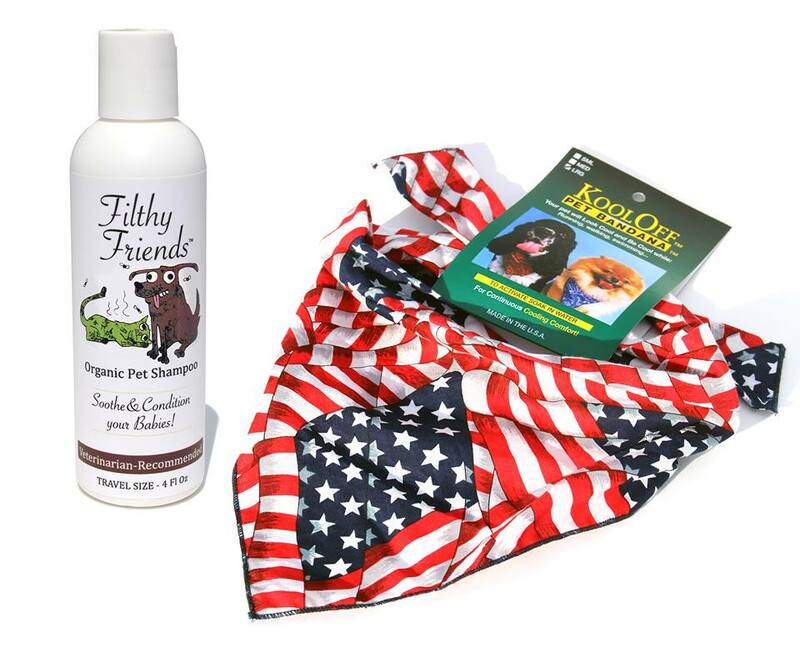 Product Description: <b>Help your Pet with the Best All Natural Cleaner & Keep Them Cool While Looking Patriotic</b> <br> <br> This unique bundle contains a 4 OZ travel size of Filthy Friends Organic Pet Shampoo and a Patriotic Bandanna with Crystals in neck band to keep you pet cool. Have you ever wondered why companies claim to be all natural yet their products include undefined “agents”, “fragrances” “preservatives” and “conditioners”? Before you say your pet has been doing just fine with “those” shampoos, consider the real advantages of using an organic shampoo. <br> <br> <b>Cruelty Free and Vegan</b> <br> <br> As the manufacture of Filthy Friends Organic Shampoo, we are proud to state it is cruelty free and contains no animal ingredients at all. <br> <br> <b>Absence of Chemicals, Dyes and Irritants</b> <br> <br> Most common shampoos contain ingredients that can make your pets’ skin become very dry; the pet scratches and may even develop a rash that makes their hair fall out in patches. Even if you take your pet to a Vet, medicine will be ineffective if the reaction is due to harsh chemicals from non-organic shampoo. 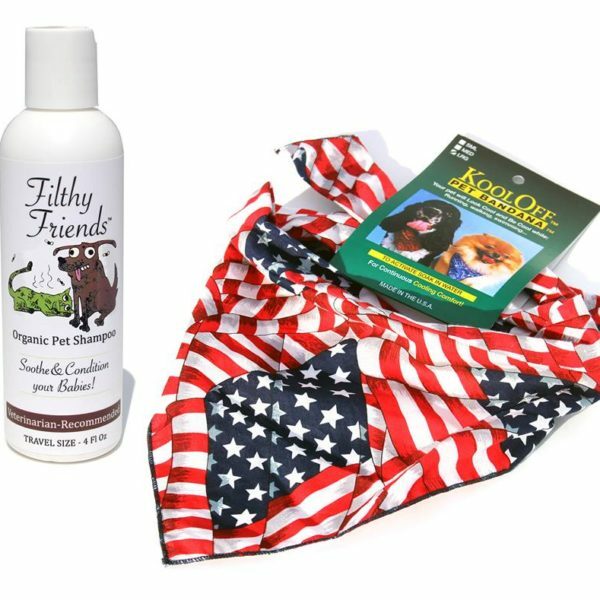 <br> <br> Filthy Friends Organic Pet Shampoo is made solely of organic oils and extracts. They haven’t been subjected to synthetic pesticides or potent carcinogenic materials found in most fertilizers. Made of skin nourishing oils, we moisturize the skin and help heal issues. <br> <br> <b>Safe for You, Your Pet and the Environment</b> <br> <br> Manmade ingredients in other shampoos can be extremely harmful to you and your pet. Using Filthy Friends Organic Pet Shampoo with biodegradable materials eliminates the potential harm to you or your pet and it helps keep our world a little safer. The purchase of our organic shampoo will protect your skin and your pets’ skin helping them have a healthy coat. This fact alone should convince you to use organic products and help save on needless pain and suffering to your best friends.